Need something to keep the kids entertained on long journeys? A fantastic idea for long journeys with children or passengers of all ages. Whether it’s for personal use, business private hire or taxis we have solutions for all vehicles and pockets. What would you choose: DVD, Digital TV or Games Consoles? Headrest screens are one of the most common rear entertainment systems nowadays within a vehicle. Having headrest screens in your vehicle can keep the kids entertained all the way, especially on long journeys. There are many different types of headrest screens that can be incorporated into a vehicle that can give many different options for the people in the back to play with. If you have two kids for instance, and one is a little girl and the other is a young boy, unless they both watch the same programmes and films, the young boy isn’t going to want to watch a girly programme. This is where the headrests come into play, they give the ability for each individual to watch what they want to watch, which in turn, saves arguments! Depending on the level of head rest screen you go for, the audio comes through a two channel wireless headphone so it gives the user the individuality to their screen without the constant battle of trying to hear their screen over the other parties, which for the driver means they can listen to the radio station of their choice. The other alternative to headrest screens is a roof mounted screen. 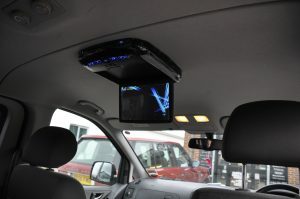 Roof mounted screens give a cinema like atmosphere in the vehicle which can be used while on the move or when you are stationary. Roof mounted screens come in many sizes with different features that will keep the person(s) in the back calm and entertained. With the ability to have the audio through separate wireless headphones to keep the noise down while on the move gives the user, like the head rest screens, the individuality to what they are watching. 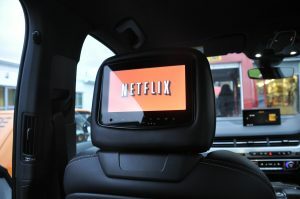 However, if everyone in the vehicle would like to hear/watch the film on the screen, simply press a button and the audio of the film will come through the speakers of the vehicle. If you have any queries about screens and DVDs, please click the button below to contact us.